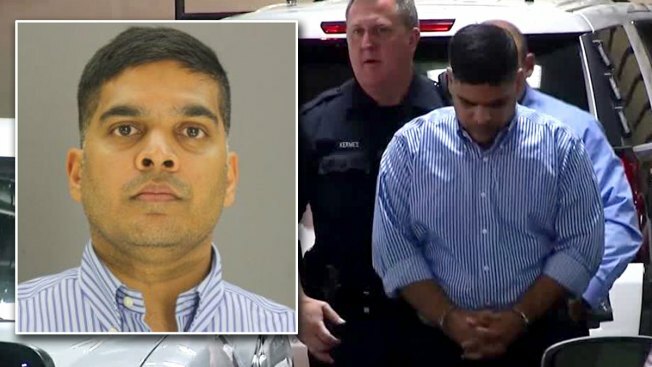 The father of Sherin Mathews, the 3-year-old girl adopted from India and found deceased in a culvert near the family’s Richardson home, was indicted Friday on a capital murder charge. Wesley Mathews, the toddler's 37-year-old adoptive father, was also indicted by a Dallas County grand jury on charges of injuring a child, abandoning a child and tampering with evidence. Sherin's body was found Oct. 22, more than two weeks after Wesley Mathews had reported her missing. Wesley Mathews initially told police Sherin disappeared after he punished her by sending her out in the night to stand by a tree near the home. The father later changed his story to police and said that his daughter choked after he "physically assisted" her in drinking milk. He told investigators that he then moved her body from the home and planned to go back later and give her a proper burial. The Medical Examiner's office ruled last week the toddler died of "homicidal violence." Prosecutors are not revealing what else they may know about how the little girl was killed. The murder indictment says Wesley Mathews used a "deadly weapon" to commit the crime. "The evidence is still unfolding in this case. We don't want anything to jeopardize this case. We think that we have a great case, we plan to pursue this case vigorously, and we don’t want anything to hamper it in any kind of way," Johnson said. Wesley Mathews was initially arrested on a felony charge of injury to a child with intent to commit serious bodily injury. He remains jailed on $1 million bond. His wife, Sini Mathews, is also in jail, held on $100,000 bond for child endangerment/abandoning for allegedly leaving Sherin home alone while she, her husband their other daughter went to dinner on Oct. 6, the night before Wesley reported Sherin missing. "The indictments handed down today by a Dallas County Grand Jury confirm what we have previously stated. Sini Mathews had nothing to do with the tragic death of Sherin Mathews." Rafael De La Garza, attorney for Wesley Mathews, told NBC 5 that he does not have a statement at this time.